Seattle Opera's Young Artists Program is finishing up studio rehearsals and about to move into the theater for technical rehearsals of A Midsummer Night's Dream, Britten's amazing Shakespeare opera. 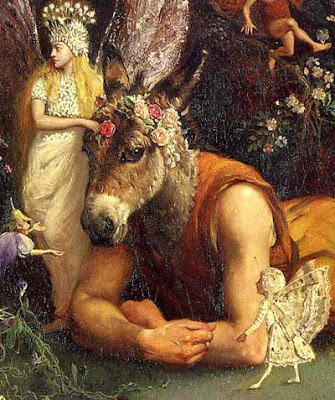 For me, the great iconic image of Midsummer is always the Beauty & the Beast moment, the fairy queen in love with a man with a donkey's head. But it's one thing to render this image as an image (see above), and something else when you have to come up with a costume piece for a theater production. Since then, in consultation with Ganser and with Stage Director Peter Kazaras, Lia has added a mesh which conceals Jeffrey's face, but leaves him able to see and hear. 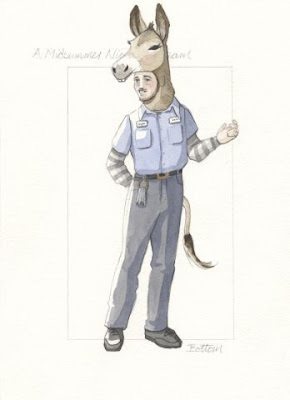 Interestingly, the mesh has the effect of forcing Jeffrey to act his part with his entire body, since his face is concealed; and it also forces his onstage colleagues (including soloists from our kids' chorus, who play Moth, Cobweb, Peaseblossom, and Mustardseed) to interact with the Donkey's Head, not Jeffrey's. My high school is doing a production of Midsummer. Is it possible we could rent your Bottom head?